2019 REU dates: Monday, June 3 – Friday, August 9. The application site is now closed, thank you for your interest. 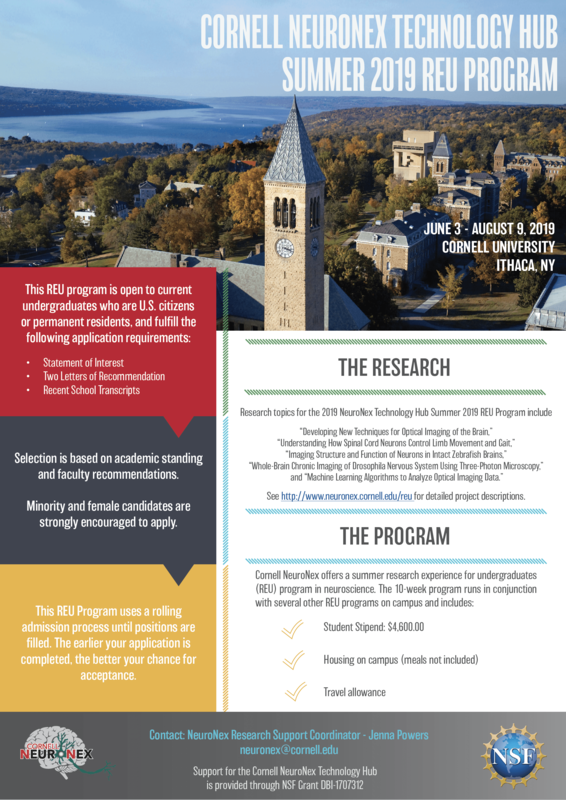 The 10-week program runs in conjunction with several other REU programs on the Cornell campus. It will be a fantastic summer learning experience that will include organized lectures, workshops, recreational activities as well as hands-on research. 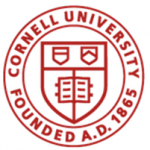 The 10-week program takes place on Cornell’s Ithaca campus and in 2019 includes: a stipend valued at $4,600; housing in a Cornell University dorm; and additional travel funds for non–CU students. Selection is based on academic standing and faculty recommendations. Minority and female candidates are strongly encouraged to apply. Housing is provided; meals are not included. This REU Program uses a rolling admission process until positions are filled. The earlier your application is completed, the better your chance for acceptance. Our lab develops new techniques for optical imaging of the brain structure and function. We are pushing for imaging depth, imaging field-of-view, and imaging speed. In addition, we are creating new laser and fiber optic systems that are optimized for our imaging requirement. Possible projects include microscope building, laser development, software for controlling the laser and the microscope, etc. 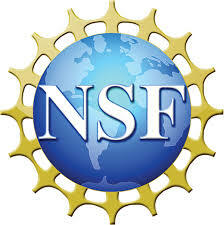 Students will be paired with postdocs or senior graduate students to work as a part of a project team. We are looking for students who are physics and engineering oriented, but with a strong desire to apply the physics and engineering methods to solve real world problems. Our lab uses multiphoton excited fluorescence microscopy to observe biological systems in living animals. This powerful optical technology allows us to observe tissues at subcellular resolution and investigate how signaling cells, such as neurons, communicate with each other to coordinate movement and gait in live animals. We are specifically interested in understanding how neurons in the spinal cord form functional circuits, called Central Pattern Generators, to coordinate limb movement and allow animals to walk, run, and perform tasks. To accomplish this goal, we must be able to observe neural firing activity within the spinal cord, and then correlate those activity patterns with quantified limb movement in mice that are awake and running. The student working on this project will be given primary responsibility for developing a limb tracking system capable of following specific points on the paw, limb and back of a mouse while it runs on a treadmill. The ideal student will have working knowledge in computer science and MATLAB. The project involves using the latest optical methods to explore the structure and function of neurons in the hindbrain of zebrafish that control movements. We are especially interested in how the organization of the neurons changes as the fish grow from larvae into adulthood. The work will involve imaging into the brain of intact transgenic fish that express genetically encoded fluorescent calcium sensors to explore how neurons are activated during behavior, or fluorescent proteins that label the cells to reveal their structure. This will be done at different times from larvae into adulthood. The proposed project seeks to exploit several virtues of the genetic model, the fly, Drosophila melanogaster, in combination with three-photon functional imaging to gain insights on how brains experience sensory information, integrate internal states and decide on motor actions. Our main goal is to develop a cuticle-intact preparation for functional imaging of the fly nervous system using three-photon imaging. This is a challenging but crucial technique that is missing in fly neuroscience research. The non-invasive three photon functional imaging preparation developed in this project will allow chronic imaging of the fly brain not only to capture the activity of neural populations in changing behavioral states, but also during long-term memory formation to capture the plasticity of neurons and to observe the activity changes during development and aging. We are interested in creating novel machine learning algorithms that will enable the streamlined analysis of biomedical imaging data in order to explore and test neuroscientific hypotheses. These algorithms will solve fundamental image processing problems such as segmentation or registration, and/or infer multivariate models that relate neural activity to behavior.